In order for me to proceed with my Tummy Tuck operation I had to get some medical tests performed to show that I was in good health and a “Medical Clearance for Surgery” form signed by my family doctor. One of the tests that I needed was an EKG (Electrocardiogram) to test my heart. EKG (also known as ECG) stands for electrocardiogram. It is is a noninvasive recording of the electrical activity of the heart over a period time. The machine used is an electrocardiograph. The EKG test is nothing to worry about. For my EKG, they took me to a room, had me take of my shirt and lie down (face up) on a cot. The nurse then attached a few “sticky type” electrodes to my skin (no shaving or anything required), then told me to lie still until it was done. It only took a few minutes of resting on my back before the EKG test was complete. Why Is An EKG Test Important Before Surgery? 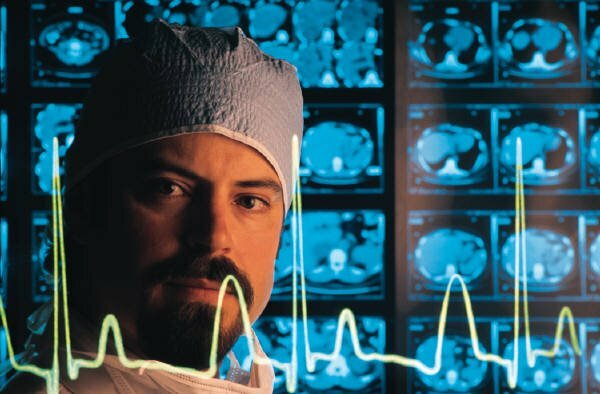 An EKG prior to surgery is an important part in preparing for surgery. They have to make sure your heart is in good enough shape to stand the stress of surgery. Surgery places great stress on the body and one of the organs most important to stress is the heart. With stress it not only beats faster but more forcefully. What the EKG does is to look at the electrical activity generated by your heart. From the pattern they can tell if you ever had a heart attack in the past (even if you didn’t know about it). It also shows if your heart is working normally. It cannot however, tell if you will get a heart attack in the future. Surgery causes stress on your body and makes you heart beat faster and harder. If you have a normal healthy heart there is no problem. If you don’t or if your heart has a poor blood supply you may have serious problems. An EKG is one of the tests doctors perform for testing the heart. It cannot predict attacks or problems. It looks at the pattern of your hearts electrical activity. From that, doctors can tell if you have ever had a attack in the past, if your heart has a normal rhythm, if the chambers are working properly (hypertrophy) and how well the conduction system of your heart works. If there is something abnormal with the results of your EKG the doctor may investigate further by ordering additional tests including an echocardiogram (echocardiography) and stress testing. Normal EKG results do not rule out the possibility of an attack, it is simply an indicator that your heart is in good enough condition that an attack is unlikely.